An easy spring or summer inspired salad that’s great for lunches and dinners. 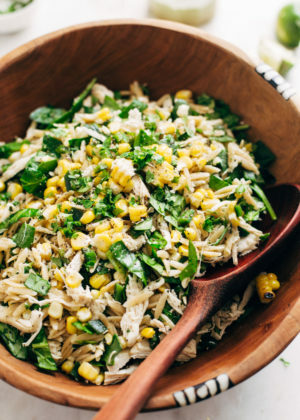 This chicken orzo salad is tossed with roasted corn and poblanos, shredded chicken, and a homemade garlic lime vinaigrette! It’s LOADED with flavor! 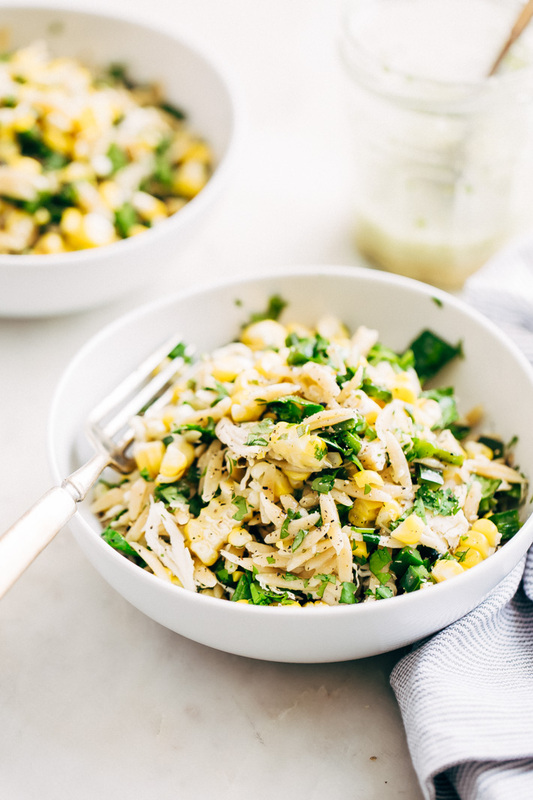 Roasted corn + smoky poblanos + shredded chicken + garlic lime vinaigrette. Pretty much all the spring and summer flavors we love, tossed together and served up in one neat little chicken orzo salad package. I’m totally feeling the Monday blues today. Why did the weekend have to end? We have two beautiful days of spring time weather here in Houston and we tried to soak in every drop of that sunshine. That’s what spring time is about here, being outdoors and eating meals that are refreshingly light yet satisfying. <– Says the person who certainly did not indulge in ‘light’ meals this weekend. 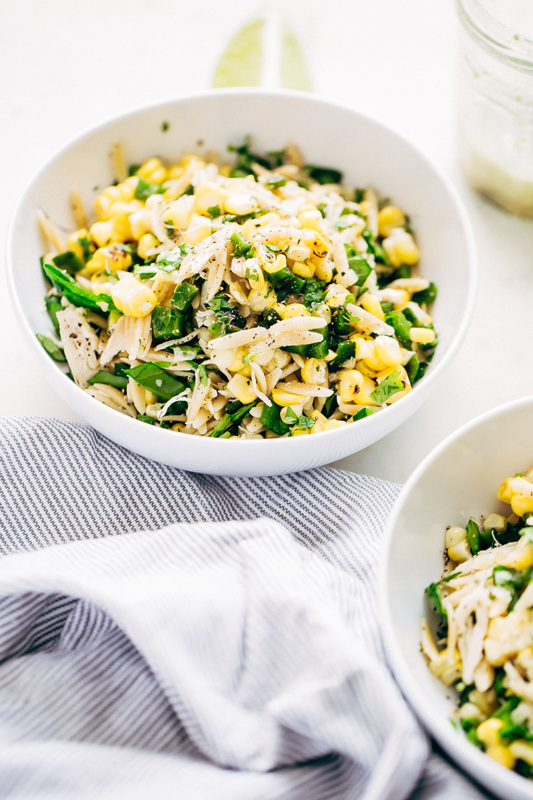 I’d like to introduce you to todays feel good lunch//dinner recipe – CHICKEN ORZO SALAD. Basically a simple throw together meal that packs on the flavor and leaves you feeling totally comfortable in your skinny jeans. 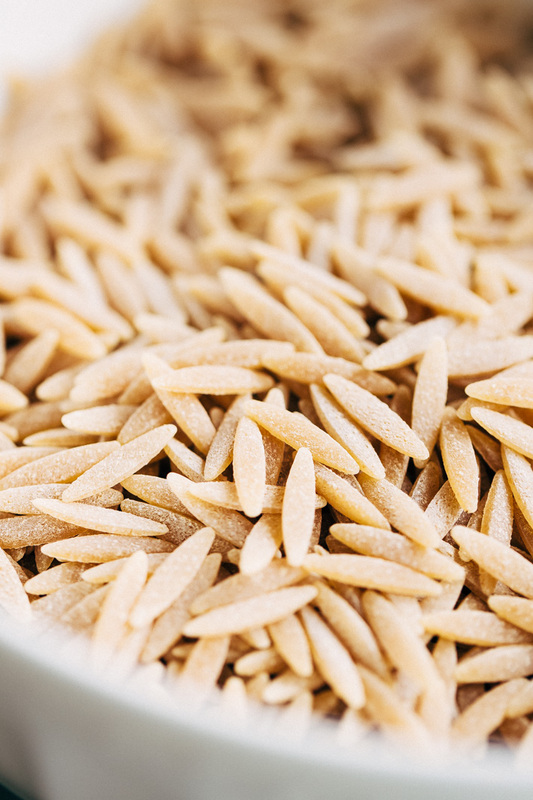 It’s clean food that uses whole wheat orzo pasta + fresh corn + blistered poblanos + and fresh baby spinach. All jokes aside, it’s seriously the best healthy chicken salad recipe of the season. And woah, that dressing. A healthy chicken orzo salad means that we’re not using any creamy dressings. Nope, none of that. Garlic + lime + cilantro + olive oil + honey – all clean ingredients that come together and pack on more flavor than any mayo-based dressing ever could. It’s some serious food perfection. ?? You had a fancy steak dinner on Friday night. No seriously. Brazilian steakhouse style steak made at home. Casual, nondiscriminatory general munching of all things on Saturday and a big fat Thai lunch on Sunday followed by the most sinful ice cream life has to offer. Woah there now, on Monday morning you’re feeling slightly bloated and your jeans just don’t fit the way they did on Thursday and you’re hungry and you want something satisfying but refreshing. And by now we all know that when I say you, I really mean me. HI THERE! It’s time to reset, grab a rotisserie chicken and get to shredding. Unless you’re one of those ultra prepared people that i’m always aspiring to be, you know the ones that bring home a bunch of chicken breasts and toss them in a pressure cooker or a slow cooker. And let them cook up and make baggies to keep in the freezer for quicker weeknight dinners. You are my food hero and that I want to be *just* like you. For the rest of us, grab a rotisserie chicken on the way home, we’re making a chicken orzo salad for dinner tonight! Can I just say that this salad loves to be meal prepped. Just keep the dressing separate and toss it in right before you dive into it. And just watch that chicken orzo salad unload all those layers of flavor. It’s a weekend detox that isn’t torture for your tastebuds. Healthy and filling chicken orzo salads for the win! GRILL: preheat the grill. Spray the ears of corn with cooking spray and sprinkle with salt, wrap in foil. Cook the orzo pasta according the package directions while the veggies are grilling. 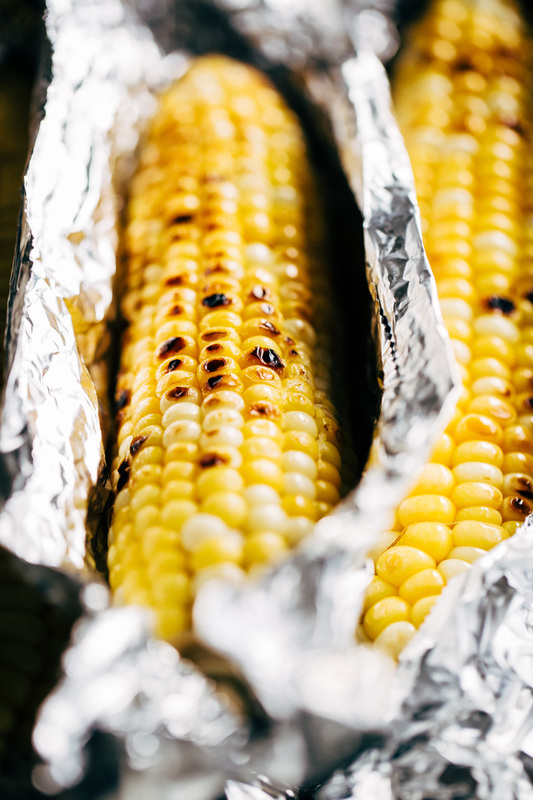 Grill time for veggies: grill the corn for 10-12 minutes turning every 3-4 minutes for even roasting. For the poblanos, grill for 4-5 minutes total or until the skin chars just a tad bit. Let the veggies cool. 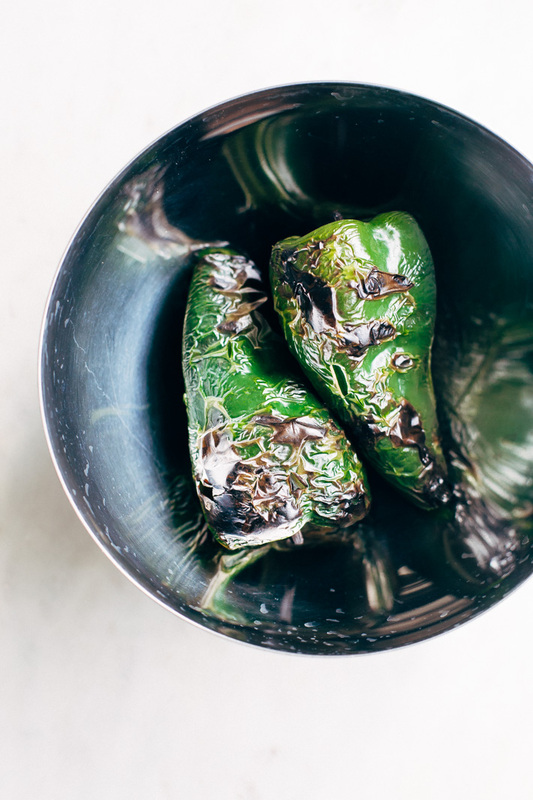 Dice the poblanos (remove the skin or leave it on, whatever you prefer). Chop the kernels off the corn. VINAIGRETTE: combine the ingredients for the vinaigrette in a small jar with a lid. 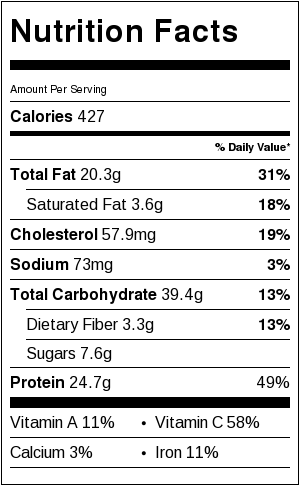 Start with 1 tablespoon of honey and a pinch of salt and pepper. Cover the jar and shake until combined. Adjust with additional honey and salt and pepper to taste. 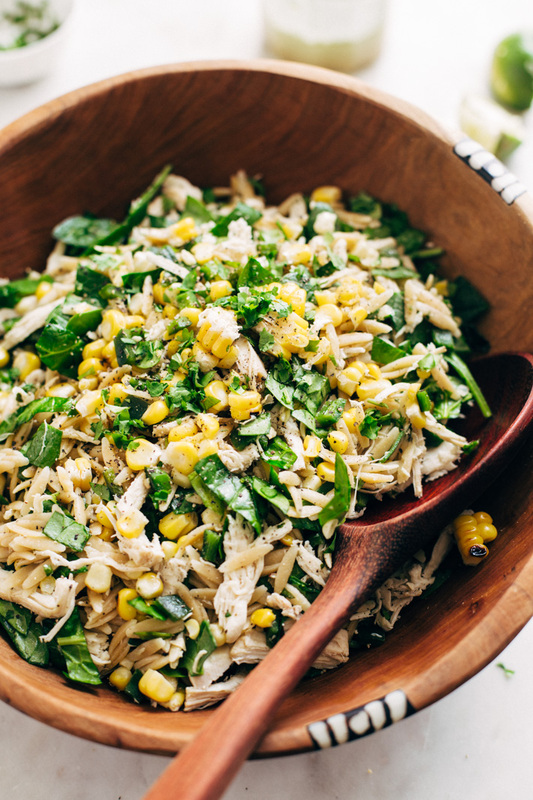 ASSEMBLE: in a large bowl, toss together the orzo, corn, poblano, spinach, shredded chicken, and cilantro. Top with desired amount of dressing and serve immediately. For meal prep: portion the salad out into containers, pack the dressing separately and drizzle on right before eating.